A drop set is a type of advanced weightlifting technique that most bodybuilders and strength athletes perform to maximize their muscle size and to increase their strength endurance. Unlike other methods of training, this allows you to continue to train just a bit longer beyond muscle failure. Although not recommended for beginners, drop sets can be used by seasoned strength athletes and weightlifters to overcome training plateaus. In a typical weightlifting workout, you lift until your muscles can no longer handle the load, which is called muscle failure. However, once you hit muscle failure in a drop set, you continue to do the same exercise with a lighter weight -- between 5 to 20 percent less weight -- for about two to four more reps, according to the National Academy of Sports Medicine. This procedure can be repeated two to three more times. 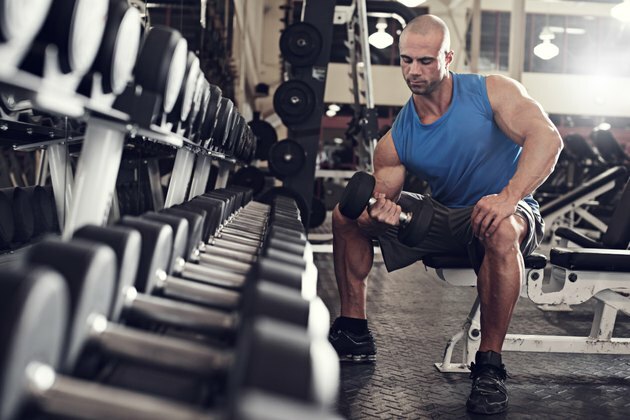 The speed at which you perform a drop set can affect how much muscle growth you can get. Doing multiple reps to failure rapidly without control doesn't always guarantee significant muscle growth. During weightlifting, your muscles contract concentrically and eccentrically, which refers to the shortening and lengthening of muscle fibers under tension, respectively. During eccentric contractions, the amount of force that lengths the muscle is greater than concentric contractions. This stimulates a greater increase of muscle growth, according to exercise physiologist Len Kravitz, Ph.D.
A sample drop-set workout would include exercises that work all of your major muscle groups: your legs, buttocks, chest, back, shoulders and arms. For example, if you get to muscle failure at 10 reps of squats using an 80-pound barbell, you do another drop set immediately for two to four reps with a weight that is 10 percent less, or 72 pounds. Squat down at a rate of four to five seconds, and stand up at a rate of two seconds. You can do a third drop set at another 10 percent weight reduction for another two to three reps at the same tempo. After you completed a drop set of squats, move on to the next exercise. Because of the high-intensity nature of drop-set training, it can cause a condition called delayed-onset muscle soreness -- or DOMS -- which can lead to swelling of the muscles within eight to 10 hours after training. During the recovery period between your training days, perform gentle exercises that keep your muscles moving, such as brisk walking, light swimming and yoga. Kravitz suggests that you warm up adequately before each training session, which can reduce your the muscle soreness intensity. The purpose of a general warmup is to increase your body's temperature and warming up all muscles. Specific warmups aim to mimic movements that are going to do in your training session, such as body-weight squats and kicks. NASM Essentials of Personal Fitness Training; Michael Clark et al. Is Lifting a Dumbbell Isometric or Isotonic?